Kate and Chelsie: The Wardorf Hilton, Hotel: Tea Dance. For those of you viewers who are not aware this show features celebrities learning how to perform many classic dances, such as the Tango, Rumba and the Waltz. The beautiful dresses, the electricity, stamina and shire grace is something to behold and I must confess I have been highly keen to replicate this. 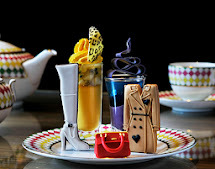 Thankfully, afternoontea.co.uk had the remedy, and sent Chelsie and I as guests to the bedazzling Waldorf Hilton to review the Tea Dance. The Tea Dance takes place on selected Sunday's within the month, and combines my favourite past time afternoon tea with the opportunity to practise ballroom dancing. The Waldolf Hilton is located in the heart of London's West end, and is very close to the cosmopolitan Covent Garden. This beautiful five star hotel first opened its doors in 1908, and has an intimate connection to luxury and in many respects England's social history. I think the most impressive fact perhaps is the link to the infamous doomed luxury The Titanic. It is rumoured the interior of the vessel is based on The Waldorf's original Palm Court and tragically many of its doomed prestigious guests spent the night before the voyage at The Waldorf. Chelsie: Kate and I were so excited to be reviewing the tea dance. The delicate touches of such a prestigious hotel were evident, for example a well dressed doorman greeted us as we entered the hotel. The Tea Dance began with a strawberry fruit tea in a lovely glass and the first, astonishing view of the beautiful Palm Court. I cannot adequately explain to you, without taking you the beauty of the court. Palm Court without doubt is the centrepiece of the hotel, gleaming white and spotless with delicate gold throughout with beautiful bygone decor. If I shut my eyes; just for a moment I could imagine what it must have been like in the Titanic era. Each guest was shown to a table pre allocated to them, the seating was arranged to form a 'U' with perfect vision of the dance floor and the five piece band playing throughout the Tea Dance. As we took our seats fellow diners began to fill the room, each dressed beautifully and this reminded us of an era that unfortunately is not as prominent as it once was. The service offered at the Tea dance was faultless from the word go, our waiter Atul gave us a detailed overview of the tea dance, the hotels history, the afternoon tea and always made sure our happiness and satisfaction were maintained. It is worth me noting that despite this being a Tea Dance, and many of the guests that attended tended to be well practised to say the least the atmosphere was very relaxed. This encouraged everybody regardless of age, and experience to have a go. For me it was truly lovely to watch everybody dancing and listen to the live band; it is near on impossible to not be swept away in such a magical enviorment for just one afternoon. Katie: The dancing, although admittedly a lot more tiring then it appears on TV was great fun, and Im so glad I tried it. The nice novelty about the tea dance, is you can get up and dance whenever you like, however for me afternoon tea beaconed.. The Waldorf Hilton has an extensive range of teas from which guests can select from, these include tea bagged and loose leaf. Chelsie and I both selected Darjeeling loose leaf, which is an Indian tea with a mild taste. The afternoon tea itself offered a very traditional selection of sandwiches with both white and brown bread options, plain and sultan infused scones with complementing strawberry jam and clotted cream and finally a mouth watering array of mini cakes. What Chelsie and I particularly enjoyed about this tea was the endless top ups of any tier throughout the tea dance with no additional charge. The Waldorf Hilton is also extremely flexible in terms of what it offers guests, this ranges from minor requests such as a bitter dislike for egg mayonnaise sandwiches to full dietary requirements such as diabetes. Chelsie: The combination of a gorgeous timeless location, beautiful dancers, great service and scrumptious food really makes for a great and memorable experience. Firstly, we must thank the very attentive and welcoming staff, they truly are an asset to the hotel, the electric atmosphere created by the five-piece band and of course all the guest that looked so wonderful on the ballroom floor . The Waldorf Hilton Tea Dance is truly magical. We have already booked into some ballroom dancing lessons and trust us we will be back! I truly urge anyone to Dance a sunday afternoon away at this fantastic event . So dont forget your dancing shoes!! It seems that you had a wonderful experience in this hotel.Your pics are very good.Interiors of the hotel is superb.